Congratulations to the AmeriCorps VISTA program, which is celebrating fifty years providing Volunteers in Service to America. Events will be held throughout 2015 to commemorate the anniversary. In his 1963 State of the Union Address, President John F. Kennedy called for a national service corps to serve community needs. On August 20, 1964, President Lyndon B. Johnson signed the Economic Opportunity Act of 1964 (Public Law 88-452), which established the Job Corp Program and fulfilled Kennedy’s vision to provide services in urban and rural poverty areas. 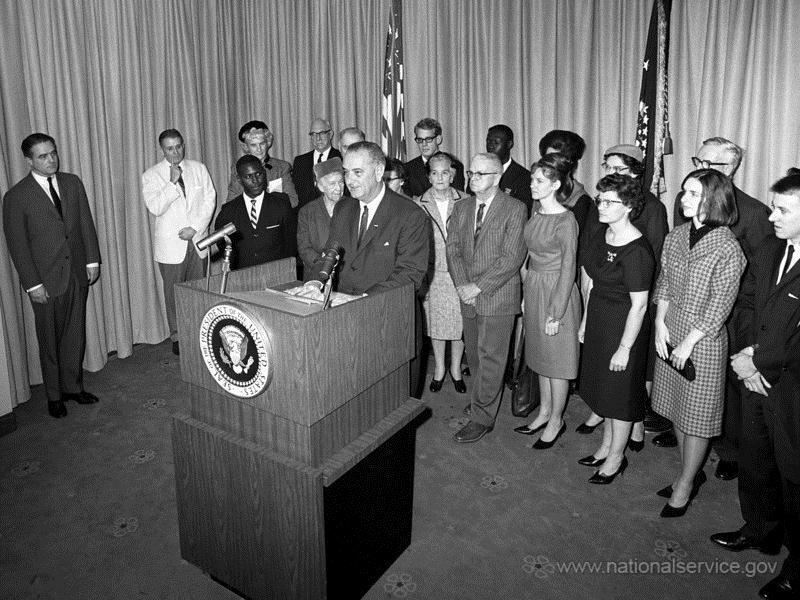 On December 12, 1964 President Lyndon B. Johnson welcomed the first group of volunteers. Today, thousands of volunteers have participated in VISTA and other volunteer programs made possible by this legislation. The VISTA program has existed in several forms in the past fifty years. Senior service programs established in the 1960s included the Retired Senior Volunteer Program, Foster Grandparent Program, and Senior Companion Program. 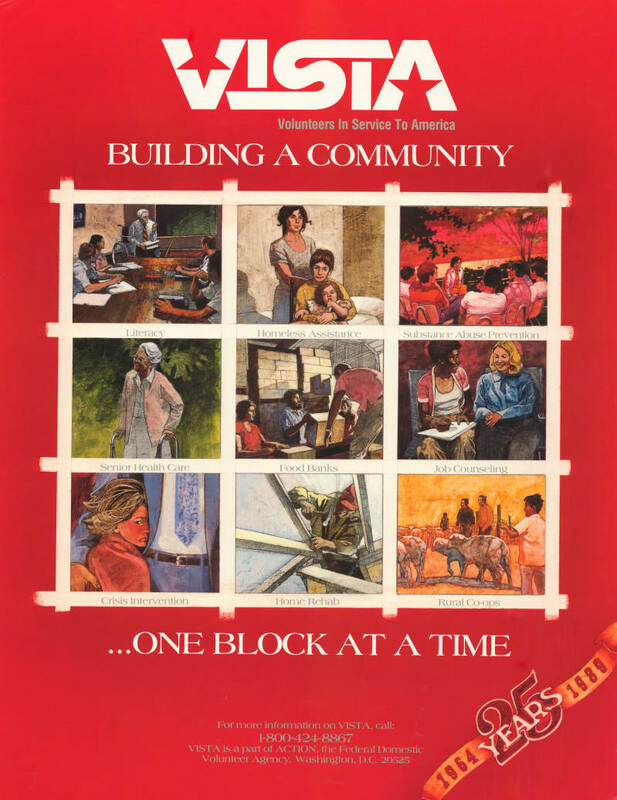 Those programs, the Peace Corps, and the VISTA program were combined in the 1970s into the Action Agency. VISTA existed under the Action Agency until it was combined with the Commission on National and Community Service to create the Corporation for National & Community Service (CNCS) in 1994. VISTA today operates as part of the AmeriCorps programs. The Peace Corps became an independent agency in 1981 and is not a part of CNCS today. A history of these programs is available on the CNCS website. Some Action Agency documents may be available in Federal depository libraries nationwide, such as the ACTION: agency for volunteer service. 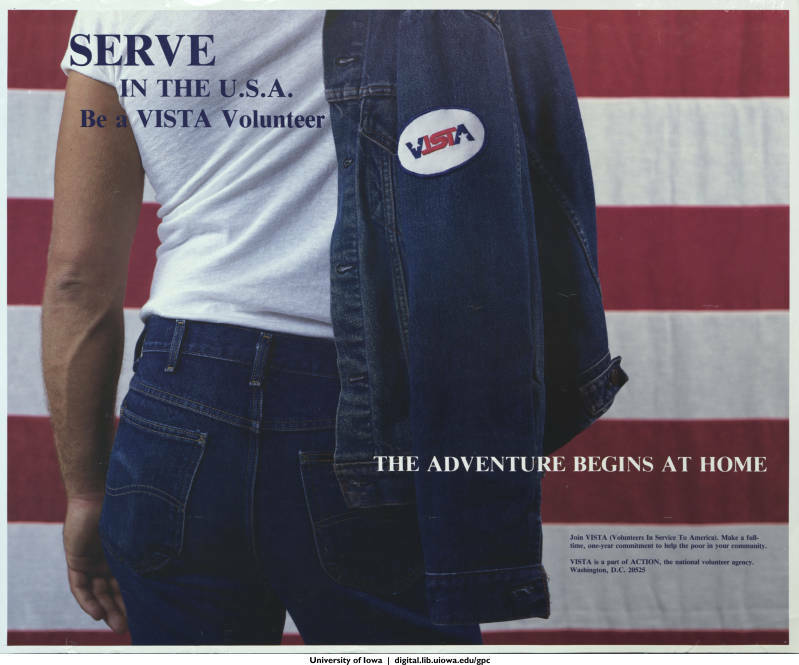 The May 2006 publication, “VISTA—in service to America,” which provides a forty year overview of the program’s history, is available online. Many photographs showing history and recent activity are also avaiable on the CNCS website. There are several reports available online or in Federal depository libraries about the volunteer programs of the Corporation for National and Community Service. Since the 1964 act to establish the VISTA program, several pieces of legislation have been passed that expanded or impacted these programs. These include Public Law 91-177, signed in 1969 to continue programs authorized under the 1964 act. Public Law 92-424, in 1972, again appropriated funds and conintued the programs of the Economic Opportunity Act. A major act to affect the volunteer service corp was that National and Community Service Act of 1990 (Public Law 101-610). This legislation created the Commission on National and Community Service, which supported programs for school age youth, higher education service programs, Youth Corps, and other service models. The National Civilian Community Corps was created as part of the National and Community Service Trust Act of 1993. This legislation also created the Corporation for National and Community Service, which combined the Action Agency and the Commission on National and Community Service. President George W. Bush created the USA Freedom Corps by Executive Order 13254. This created a council to work across executive agencies to foster a culture of service by increasing public service opportunities. The most recent legislation was the 2009 Serve America Act (Public Law 111-13). This act, signed by President Barack Obama, reathorized and expanded national service programs administered by the Corporation for National and Community Service. Over the years, AmeriCorp and volunteers in these national programs have been recognized in official Congressional material for the achievements of the volunteers. For example, House Resolution 453 was recored in the Congressional Record on June 9, 2009. AmeriCorp VISTA is celebrating it’s 50th anniversary kicking off in 2015 with a National Solutions Summit at the National Museum of the American Indian in Washington, DC on February 25th. The event may be attended in person, or some portions will be available for streaming online. In addition, Community Summit Spotlights will be held across the U.S. from April to December. Check out the celebration Web site for information about the events and how you can get involved. The thousands of members of the VISTA community are using social media to connect and share their experiences. Check out the #VISTA50 tag on Instagram and Twitter, and follow @VISTAbuzz. You can also follow the official blog of the Corporation for National and Community Service to keep up with news and events and opportunities to serve. Today, the Federal Agency Corporation for National & Community Serivce continues to facilitate service to build community and combat poverty across the U.S. Established in 1993, the CNCS is active in every state and works collaboratively with national, state, and local entities. AmeriCorps VISTA volunteers continue to commit to the mission to bring individuals and communities out of poverty. Check out this interactive map to see what projects are going on near you. For example, since 1994, over 5,100 District of Columbia residents have served more than 7.3 million hours of community service. Many reports on projects and statistics on service are available for every state. You can also check out the agency Web site for more information if you are ready to serve. Are you interested in volunteer services in America? The U.S. Government Bookstore offers a variety of publications that relate to this topic. How can I get publications about Volunteer Services in America? Order by Phone: You may also Order print editions by calling our Customer Contact Center Monday through Friday, 8 am to 5:30 pm Eastern (except US Federal holidays). From US and Canada, call toll-free 1.866.512.1800. DC or International customers call +1.202.512.1800. About the author: Cathy Wagner is an Outreach Librarian with the Outreach & Support team in the Library Services & Content Management (LSCM) unit at the Government Publishing Office.